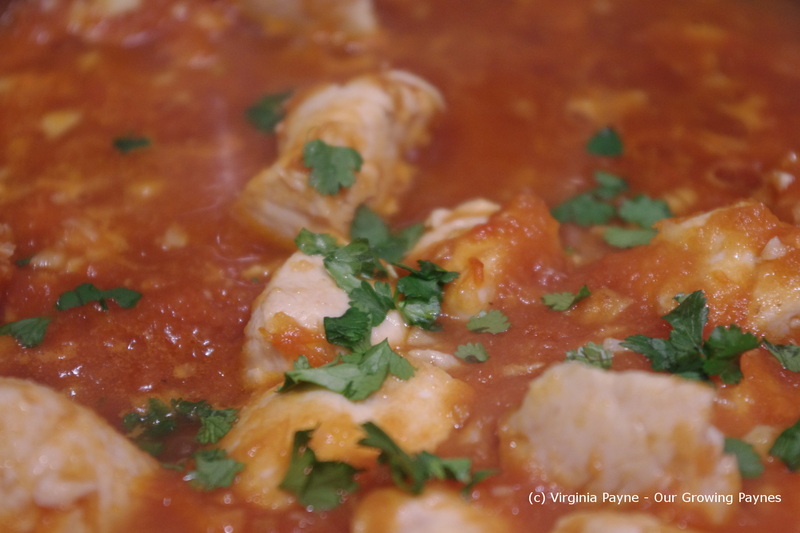 Last week I came across this wonderful looking recipe from Karista’s Kitchen. It was for Slow Cooked Red Ginger Chicken and I knew I wanted to do something like this. But I didn’t have a lot of time and it was cold and I was tired but I wanted the flavour. So I took inspiration from her recipe and came up with this. I do plan at some point to follow hers when I have a chance. This recipe is served on a baked potato so you’ll need to get that cooked while this is being prepared. 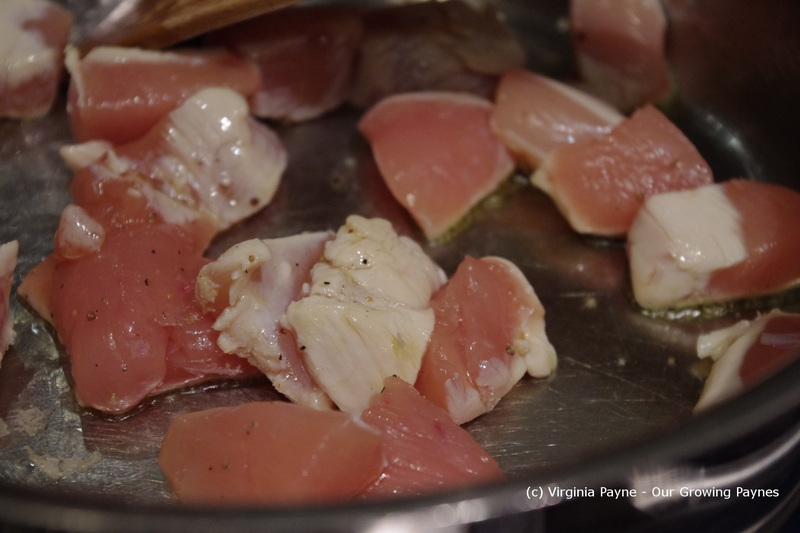 I took a chicken breast and cubed it then sauteed it in olive oil, salt, and pepper. 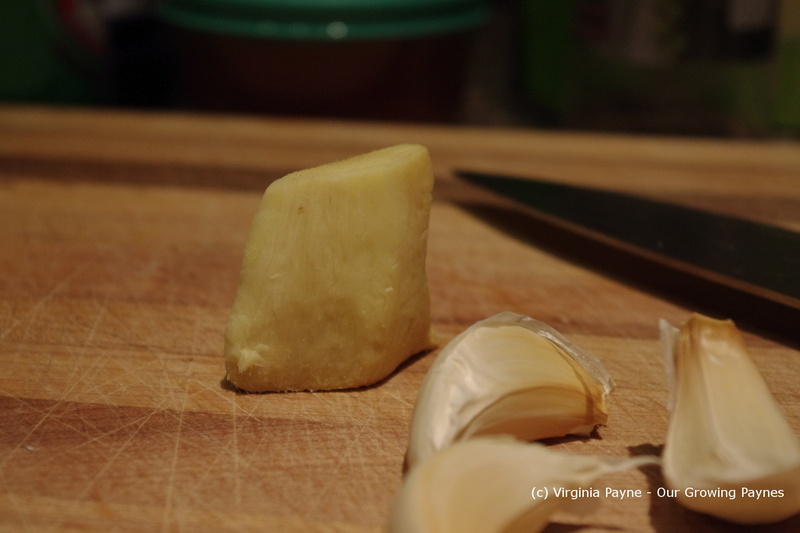 While that was cooking I finely chopped several cloves of garlic and peeled a chunk of fresh ginger. The ginger was about 1 1/2 inches by 1 inch by 1 inch or so. I tossed in the garlic and added 1 cup of my homemade tomato sauce. As that started to simmer I used a zester to finely mince up the ginger and added it to the mixture. I added maybe a 1/4 cup plus of soy sauce. I prefer to use the low sodium kind. 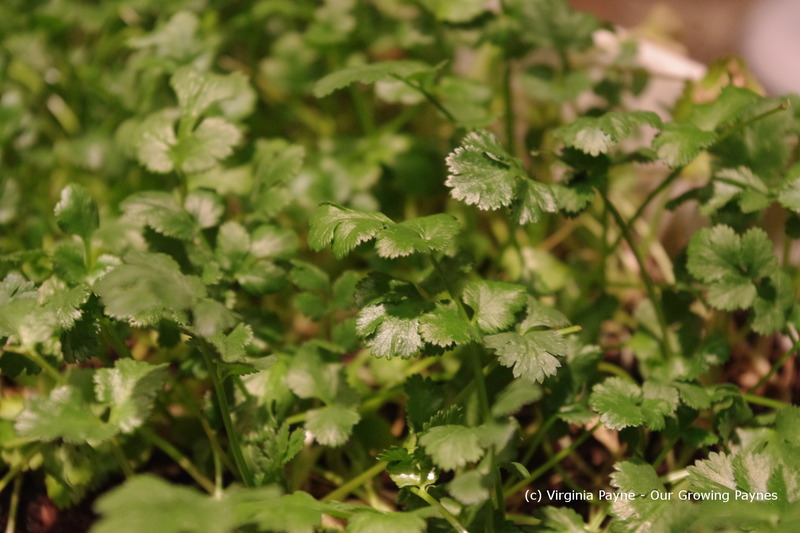 We are growing cilantro (coriander leaves) so I had some fresh leaves to chop up and add to the dish. 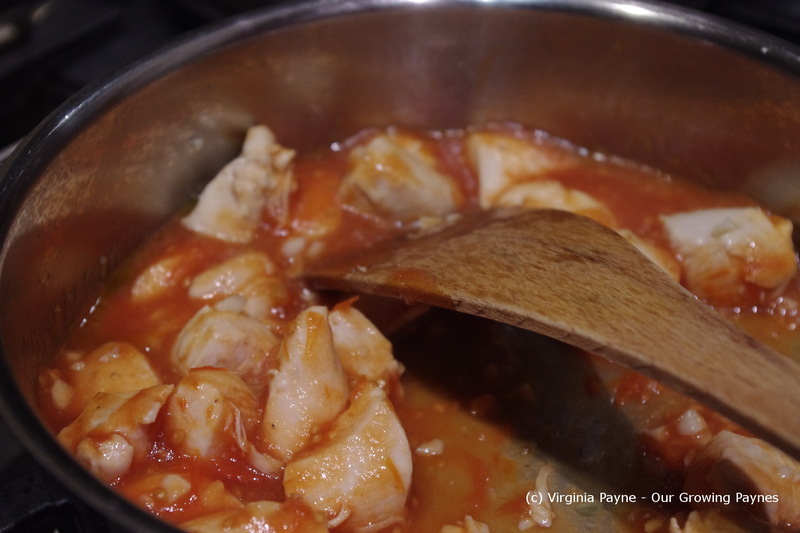 I added a splash of lime juice to taste and let it simmer until the chicken was fully cooked. 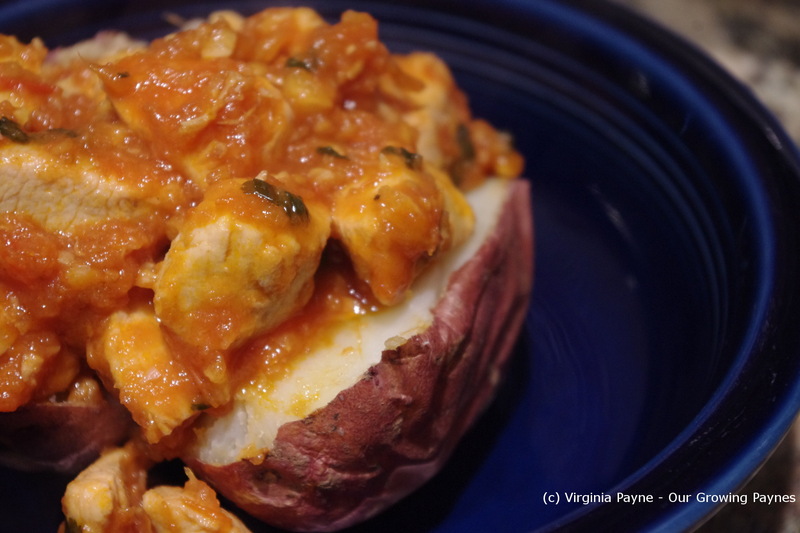 Slice the baked potato open and top with the chicken and sauce. I loved the brightness of the ginger in this dish. It was a great comfort food meal without being heavy. Overall a pretty healthy meal. This entry was posted in Chicken Recipes and tagged chicken, cliantro, cloves of garlic, cooking, dinner, food, garlic, ginger, ginger chicken, homemade tomato sauce, lime juice, olive oil, potatoes, salt and pepper. Bookmark the permalink. Oh good, I’m glad you like it. 🙂 It’s definitely more rustic than yours. But I wanted to also use what I had on hand. And you’re welcome on the mention! Credit where credit is due. Definitely trying this recipe. I tried making my own ginger/curry chicken the other day and although it tasted good, there wasn’t much of a sauce as I had hoped. Seems like tomato sauce is part of the answer (; Thanks for sharing! You’re welcome. Yes the tomato sauce helped a lot. You could also go the coconut milk route. Great winter supper. I always have chicken breasts and home made tomato sauce in the freezer. Excellent standby. So much can be done with those two ingredients, it’s wonderful. What delicious looking, warming food. I could really do with some right about now! My MIL says Dorset is enjoying a bit of snow. :). You need something warming! Great idea! I just made a big pot of marinara sauce; maybe I’ll try doctoring it up as you suggest. Ginger is definitely one of my go-to ingredients! It’s one of my favourites as well. My favorite kind of recipe: easy and tasty, I would never have thought to serve this over a potato and love the sound of it. I’m going to “pin” this so I won’t lose it. Thanks. 🙂 I hope you enjoy. This sounds so tasty! I love chicken and there are only so many variations you can do. This is perfect. Loving the ginger and over the potato! Bookmarked!! It’s perfect for a busy day where you want something tasty but it needs to be quick. Very tasty… might have to try this recipe out. Just pinned this, it sounds great and I love that you used it as a potato topping!! Yum! !